How does one describe Grapes? Is it a bunch of purple circles on a page, or the one in cartoons, where the nurse feeds you because your entire body is in a cast. Cartoons always allowed an impression of food being mouth-watering and unattainable. A child may dream of the Thanksgiving turkey but must expect a kiwi in real life. 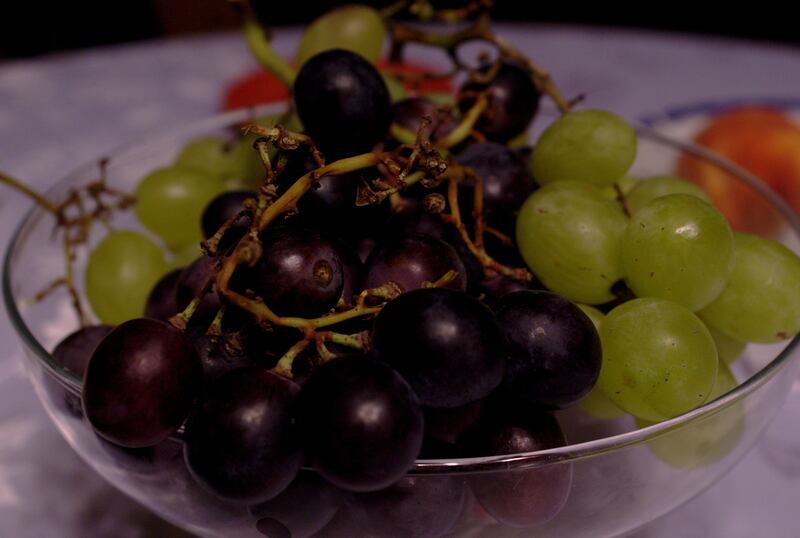 Grapes, the fruit that comes in green and shades of purple. Such a beautiful fruit in the basket of all fruits. While one generation may think of wine, the other of Jam and the rest in colouring books and charts. This was my first encounter with this fruit. On the wall, and for the letter- G.
Once I got tired of scanning and testing my five year old memory with nursery rhymes, I’d go out and play. Careful enough not to get caught by the other teachers or the Head Mistress, whose room was just above the slide and swing set. After a couple of slides, I ran to the nearby Ice-cream parlour, again careful enough not to get caught by my grandmother for crossing the road without supervision. Black-current ice cream was the closest I could get to the grapes on the wall. I’d imagine the grapes while licking the ice cream I held dearly in my hands. There were days I chose the candy stick but often times, I’d always get the cone. There was something special about an ice cream cone, whether it depicted a price or flavour, it was just ice cream and biscuit. When you’re in school, you are more open to challenges in life than in your exams. It’s the certain atmosphere one feels when you’re in the classroom or a group, that is invisible from the outside. For me, this judgement aboded in the Kwality Wall’s Black currant cone, other days it was chocolate or butterscotch. During our lunch breaks we weren’t allowed to leave the campus, but the high schoolers could. We were given an hour, an hour for food and we had no canteen but the tiffin boxes in our lap. This was when I realised, you were judged by the type of lunch box you ate from. Fancy plastic boxes with cartoons on them and glittered the kids who did not speak to the ones with steel dabbas. I was the steel dabba girl and I had a steel dabba friend, we’d share our lunch, her lemon rice with pickle and last night’s dinner. It was a beautiful bond, a bond that lasted on day old food and gossip. After school ended, we were free to waltz around while waiting for our auto or the van to come and pick us. The later they came, the more fun it was for us. This was where I’d go to the bakery at the end of the road and look at the ice creams in the white box. Orange candy, Mango candy, Kulfis, Choco bars, Nutty bars and the special cones. These cones were always next to the candy sticks and were expensive. If a middle school kid could be seen with one of those cones in their hand, it said something. Either it said that it was a gift from a lover or money and power. I was brought up in a house where pocket money wasn’t as frequent as the disciplinary lessons I got. So it had to be a special occasion if I had to have a cone ice cream. And adults think they have it going bad, they should meet school kids. Ice cream could marginalise and depict something other than just a flavour in their world. In the world I live in, blackcurrant cone was different from the candy stick, but it will always remain the grapes on the wall to me.